Check out the credentials from the sites to see if it’s an approved dispensing pharmacy by Pharmacy Checker and CIPA before you buy Incruse Ellipta (generic umeclidinium bromide. We currently have the brand Incruse Ellipta from Canada and United Kingdom manufactured by GlaxoSmithKline Inc. CanadaPharmacyOnline.com is a leading Canadian dispensing pharmacy that dispenses different versions of Incruse Ellipta from international fulfillment centers. There is no generic form of Incruse Ellipta inhaler till date. Buy Incruse Ellipta online at a competitive price or Call 1.866.920.3784, we accept Master Card, ACH (Check by Phone), Checks, and money orders. Customers who purchase Incruse Ellipta also buy Anoro Ellipta and Breo Ellipta. Incruse Ellipta is used as a long-term, once a day maintenance treatment for making breathing easier for people who experience breathing difficulties (such as shortness of breath) due to a lung disease called chronic obstructive pulmonary disease (COPD) (including bronchitis and emphysema). This medication helps to decrease the symptoms of COPD and increase your lifespan. It is a long-acting muscarinic antagonist (LAMA) which relaxes the muscles in the walls of small airways in the lungs. This helps to open the airways and make it easier for the air to get in and out of the lungs. When taken regularly, it helps to prevent wheezing and shortness of breath. There is however no cure for COPD, but Incruse Ellipta helps to control it. Hence, you should continue to use the medication even if you feel fine. It is important to quit smoking before using Incruse Ellipta. The available dosage form of Incruse Ellipta is 62.5 mcg/30 dose. Use Incruse Ellipat exactly as prescribed by your doctor. It is usually taken once a day by inhaling it into the lungs through the mouth. Do not increase the dose, or use it more frequently or stop taking it before talking to your doctor. The usual dose is one inhalation through the mouth once a day. Do not use Incruse Ellipta to treat sudden severe symptoms of COPD such as sudden shortness of breath or wheezing. If you experience this sort of attack you must use a rapid onset, short duration, inhaled bronchodilator such as salbutamol (rescue medication). Do not use this medication if you are allergic to any of its ingredients, have lactose or severe milk protein allergy or are less than 18 years of age. Tell your doctor about your medical problems such as heart problems, eye problems, prostate or bladder problems before using Incruse Ellipta. 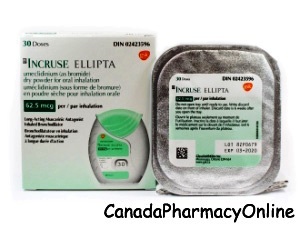 Incruse Ellipta is not usually recommended for use during pregnancy and may pass into breast milk. Hence, check with your doctor before using it, if you are breastfeeding. Incruse Ellipta may interact with medications such as short- or long-acting muscarinic antagonist (e.g. ipratropium, tiotropium, glycopyrronium, aclidinium). 1. What should I avoid while using Incruse Ellipta? Answer: If you experience dizziness or blurred vision while using Incruse Ellipta, do not drive or operate heavy machinery. 2. Is Incruse Ellipta a bronchodilator? Answer: Incruse Ellipta is a type of bronchodilator and is supplied as a powder for inhalation.